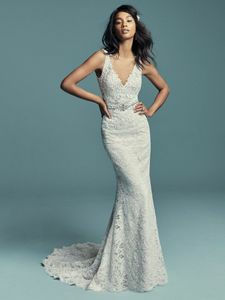 Description: Classic yet boho-inspired, this allover A-line lace wedding dress features lace motifs along the bodice, V-neckline, straps, and scoop back. Complete this look with an optional beaded belt (BB8MC650). Finished with covered buttons over zipper closure.